Elements up to the weight of iron are manufactured in stars. The process begins when a star forms from a collapsing hydrogen cloud. 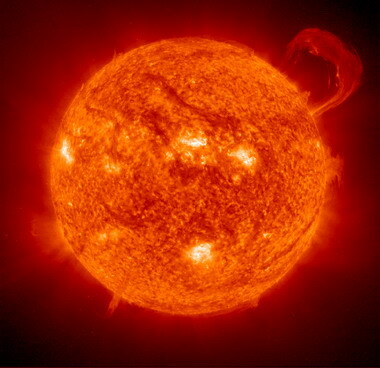 The gravitational pressure at the star's core generates heat, which ignites a thermonuclear fusion reaction that converts the core's hydrogen into helium. This process, called "nucleosynthesis," continues until the core's hydrogen is exhausted. What happens next depends on the star's mass. Observations indicate that most stars are massive enough to enter a second round of nucleosynthesis. The depleted core - now rich in helium - contracts further, generating enough heat to start a thermonuclear reaction in a shell of hydrogen surrounding it, which fuses that hydrogen into helium. If the core's temperature gets hot enough, it undergoes a second wave of thermonuclear fusion itself, turning its helium into carbon and oxygen. The more massive the star, the more generations of nucleosynthesis it will experience. The most massive stars can have several layers of fusion going on at the same time, with the outermost converting hydrogen to helium, a shell beneath it turning helium into carbon and oxygen, a shell beneath that producing heavier elements, a shell beneath that creating even heavier elements, and so on down to a core in which iron is produced. Elements heavier than iron are formed when a supernova explodes. Once a star forms an iron core, its days are numbered. Up to that point, the nuclear fusion reactions produce energy, creating an outward pressure that counterbalances the inward pressure of gravity. But iron fusion uses up energy instead of producing it. So the outward pressure stops and even reverses, gravity takes over, and the star rapidly implodes until suddenly a vast number of neutrinos blast out of the core, blowing the rest of the star to bits in a supernova explosion that may be as bright as an entire galaxy. 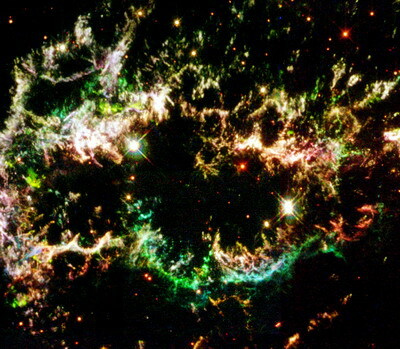 These gaseous supernova remnants glow in colors determined by the elements they contain. For example, the dark blue areas are rich in oxygen and the red material is rich in sulfur. Since this happens only to very massive stars that have undergone a full range of stellar evolution, the explosion releases a wide variety of new elements into the interstellar medium (ISM), which may ultimately incorporate them into new stars and continue the nucleosynthesis process. The violent supernova blast produces powerful shock waves which create regions so dense and hot that they fuse some of the star's heavy elements into still heavier elements. 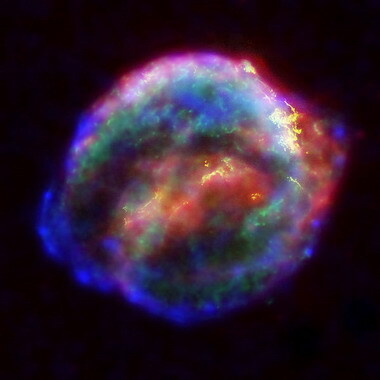 It is in these supernova shocks that all natural elements heavier than iron are created, including uranium, the heaviest natural element found on Earth. Supernova shocks create even heavier elements (as do experiments with supercolliders), but they decay much more quickly than uranium.